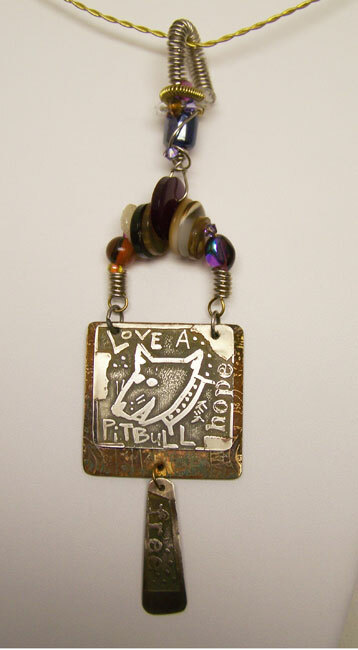 From my Pit Bull Rescue series, this pendant has a sketch of a smiling puppy etched into pure nickel silver, on an etched brass base piece--which flips up to reveal a surprise!--3 kitty companions! I've added an interesting bail design, using coiled wire and buttons for a vintage look. The coiled wire bail is very roomy, so you can choose almost anything to use as a necklace. The bottom charm is etched with the word "free" (it's not very clear in the photo, but is quite clear in person!) The main pendant measures 1 5/8" x 1 1/2"; including the bail and bottom charm, the total length is 6". I've polished it with Renaissance Wax, to preserve the finish.